Harrow Council chief executive Michael Lockwood has today (20 October) been confirmed as the first director general of the new Independent Office for Police Conduct (IOPC). Major reforms to the IPCC – including its renaming as the IOPC – were announced by Prime Minister Theresa May during her time as Home Secretary. 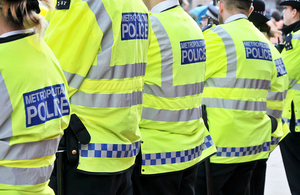 The IPCC oversees the police complaints system in England and Wales and sets the standards by which the police should handle complaints. The changes to the IPCC include a new governance model to improve efficiency. The IOPC will have new powers, helping it to become more effective and more decisive in addressing public concerns, including to initiate its own investigations without relying on a force to record and refer a particular case for investigation, and to determine appeals and recommend remedies. Michael Lockwood’s crown appointment means he will be the single executive head of the organisation when the IPCC officially becomes the IOPC in January 2018, replacing the current commission. He will ultimately bear responsibility for all decisions made in the IOPC’s investigations and appeals, including the investigation of the most serious and sensitive allegations involving the police. I’m delighted to announce Michael Lockwood as the first director general of the IOPC. His appointment is a key milestone in the reform of the IPCC, and will ensure clear accountability and oversight for the running of the organisation. We are absolutely determined to make the police complaints and discipline systems simpler and more transparent for the benefit of the public, and the new, more efficient and effective IOPC will be a vital part of that. I am very grateful to the IPCC for its considerable support in developing the proposals for the IOPC. A board, appointed by the Home Secretary, that includes a majority of non-executive directors, will provide independent support and challenge to the director general as well as oversight of the overall running of the organisation. Mr Lockwood has a background in both the public and private sectors and has been Harrow Council’s chief executive since 2015. It’s an honour to be appointed as the first director general for the IOPC. This is an important time for the organisation, as the IPCC transitions to the IOPC. I look forward to working with the dedicated staff there as we reshape the organisation to ensure the police disciplinary and complaints system is as effective and as clear as possible.